Recently, I had the honor and opportunity to attend a keynote address by retired Lieutenant-General Roméo Dallaire. I had been invited by my dear colleague and filmmaker Leigh Badgley to attend the Allard Prize for International Integrity in which the following short film Allard Prize for International Integrity 2015 Finalists of hers was being showcased. More about the prize a little later, but my focus is mainly on the speech by Romeo Dallaire and its impact. I first got a glimpse of him as he entered the stage with the prize committee all of whom were dressed in colorful academic robes. As he was sitting there, he looked somewhat stiff and slightly uncomfortable. He was about to receive his honorary degree and as the announcer introduced him, I realized that he was the Canadian officer depicted in the movie Hotel Rwanda. 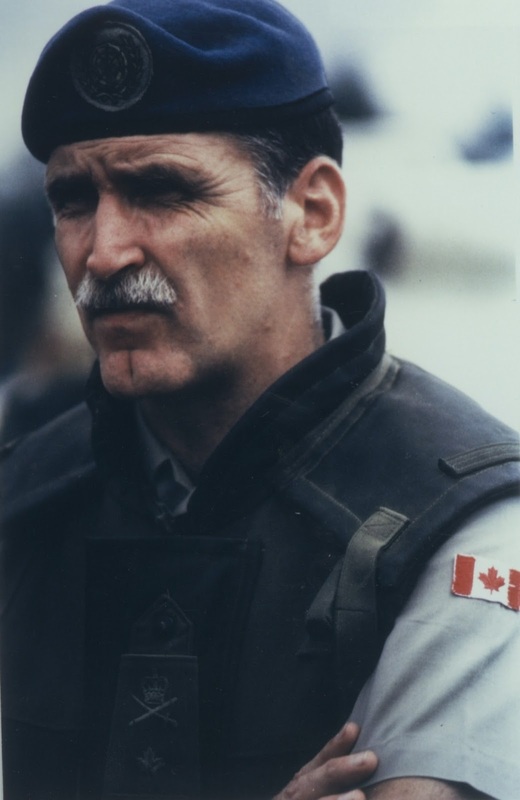 In Rwanda, he had disobeyed his UN orders and had followed his own ethical guidelines to ensure the safety of the African citizens and to stand up against genocide in that country; Dallaire is credited with saving the lives of more than 30,000 people. Already we see two traits here, one, a person who is not tied to blind obedience and discipline, and second, a person who is rooted in deep morality. Dallaire did not speak immediately after receiving his honorary doctorate, but came back a little later for his keynote speech. This was a good idea because when he returned he had taken off his academic cape and wardrobe and looked much more human and comfortable as a result. Right after his first words, we sensed that he had a sense of humor. He had some words for his daughter who was studying at UBC for her MBA and bragged to her that he had already received his doctorate just like that. Then, he shared his love for public speaking with us and the fact that he likes to show slides; it was the first of over 126 slides, he joked, and this was already the cut-down version. Yet he was not there to clown around or to merely entertain us; in fact, he had a lot of interesting observations to make. He shared some of his personal stories and ideas, which ought to be heeded and followed by us all, citizens, politicians, and military personnel alike. First off, he looked at the question of humanity. Many times we overlook the humanity of others, particularly when it comes to our opponents. In our mind, whether consciously or not, we strip them bare of their humanity and see them as monsters or perpetrators of evil. One of the biggest and saddest issues that concerns Dallaire - and he has devoted significant time and energy towards this - is the continued use of child soldiers. This should not happen and children should not be viewed or treated as enemy soldiers. While adults may have their disagreements, children should not be dragged into these conflicts and not be sent to the front lines with weapons in their hands. He gave us a personal example when he was in Rwanda. They were driving on a narrow strip, a no man's land marked between the Hutu and Tutsis, and they encountered a young boy of six or seven at the crossroads. They had heard of potential ambushes that used this method of distraction. The boy had a protruding belly of hunger and looked demarcated and innocent, but Dallaire and his fellow soldiers quickly got off the jeep and searched the surrounding areas for hidden attackers. Yet they found nothing but empty huts filled with corpses. Then when they had cleared and secured the area, they returned to the road and found that the boy was missing; he was not at his previous spot. They now continued the quest for him and finally found him in a hut on the other side with what must have been his parents whose corpses were half eaten by wild animals. So they took this boy with them and Dallaire looked him in the eye and did not see any enemy or monster but a boy like any other. These were the eyes of a troubled soul, but more importantly, those of a human being. And he was reminded of his own son of about the same age; he had left him behind in Canada before embarking on his mission. This boy was essentially like any other except that he had been afflicted with the greatest tragedy, while other children elsewhere - in particular fortunate places like Canada - have both rights and privileges and live a generally carefree and innocent life. The suffering of children continued to affect him in addition to those grisly images he must have seen in times of duty and in his later missions and visits to troubled and war-torn areas. He had just returned from the refugee camps in Syria and said that there were many people living under deplorable and miserable circumstances. There were young children and teenagers who were stuck a this place doing nothing, trying to survive at best and who were losing up to four years and counting of their lives. This time could have been filled with education, but effectively it was dead and wasted time. These young people would never forget those horrible and gruesome situations they had been exposed to, and they would carry around this emotional baggage with them; they would perhaps point blame at others or germinate later plans of destruction and create further suffering for others as well. These are things we rarely fully understand or picture in our minds. We live a comfortable and sheltered life and know little of what is going on around us in other parts of the world. We hear about the extreme situations of refugees dying during their escape, but little do we think about all those who are stuck there and whose daily life consists of endless moments of suffering strung together into a bleak future. Our political leaders miscalculated their moves because according to Dallaire, Syria has converted to a place of utter and (almost) irreversible chaos and mayhem. Military airstrikes had very little effect, if any; if the international leaders wanted to solve the issue now, it would take at least a hundred thousand foot soldiers. The leaders have waited too long to act and the whole situation has now gotten out of control. Moreover, Dallaire praised all those who are ready to fight corruption (the main theme of the evening and symbolized through the works of those courageous nominees) and that often such change comes at the price of blood. He also said that the status quo is a fallacy and can only lead to stagnation. What we need to do as individuals is to ensure that there is constant change and progress at every moment of our lives. We should never stand still, but always look and move ahead to make this place a better and safer place for us all. He even mentioned the word “revolution.” He said he could say it now that he is retired and not under the army's spell and command anymore. Such changes are indeed necessary for a better future. Some international courts decrying war crimes is a good step; that there are many exceptional people working towards international peace and towards accountability of wrongdoers is commendable, but perhaps we should also have a court that decries corruption and has international leverage to enforce issues. Finally, corruption happens everywhere, whether we see it or not. However, it is our duty to expose corruption, to condemn it and not let those evil-doers get away with those crimes. As he was talking about social justice and personal engagement, and, in particular, the plight of children, which moved me most, I could not help thinking that my contributions on this front are generally negligible and rather insignificant in comparison. I should do more and perhaps (and hopefully) raising a little of awareness here would a first step towards that goal. As we gave him a standing ovation and as I was thinking that he fully deserved his honorary degree (in fact, I would have given him two or more) he added two things in closure: one, that he was proud serving in the army, and two, that we should treat our vets, especially those who put themselves in danger and who suffer maiming and mental torment for us with more respect. I cannot imagine the scenes of death and destruction that they must face in times of war, and I wonder how they can still uphold faith in humanity and the human race after witnessing such atrocities. This is perhaps why Dallaire kept repeating that things are looking not so good and that we have failed on many respects. Yet one thing is for sure, they are heroes as they risk their lives and mental health for us. As this is Thanksgiving Day here in Canada, I would also like to extend and include my thanks and admiration for all those who stand up and fight against injustice here and around the world. We saw four nominees that risked their own safety and well-being to expose corruption in their respective countries, be it in Indonesia, Russia, Angola or Kenya. However, I believe that one must do what one deems necessary and that paying with blood or putting your and your loved ones' safety at risk ought not to be the prerequisite for everyone. One can bring about change in smaller ways by doing what one can. That can be blogging about such issues, raising awareness, donating for good causes as well as voting responsibly. But to all those who are willing to take the extra step with the evident risks attached to it, I raise my glass of wine to you and offer my heartfelt thanks!